This pattern is worked in spirals. The rows are not closed. The new row starts in the first stitch of the previous row. Put a little bit of stuffing in the stem and sew it to the bottom of the tree. 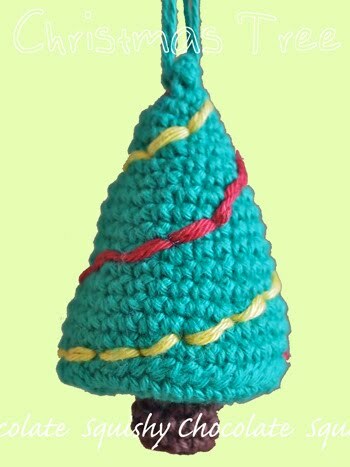 Use colored thread to embroider the decorations on the tree. Liever Nederlands? Het originele, Nederlandse patroon staat op mijn eigen blog. © Birds of a Feather. Powered by Blogger.